Tank Details: 40 Gal (was given to me, so I don't know the brand). 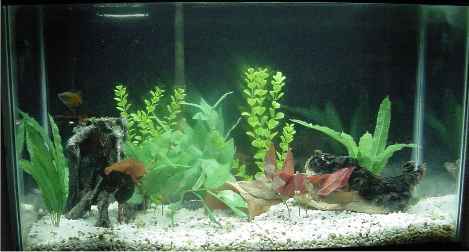 The Fish: 2 Gourami's (I've seen them called spotted and also blue gourami's....the mystery still continues...), 2 Sunset Gourami's, 6 Neon Tetras-use to be 7 *sniff*, 1 Rainbow Shark. Comments: Right now those are plastic plants. I plan on starting live plants soon. The filter is a whisper filter. Quiet as can be! Fine gravel. I will add my 2 Clown Loaches soon (they are on a search and destroy mission in my other tank...dang snails! ).